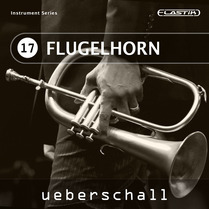 You get two for the price of one with this review, with two closely related sample libraries from Ueberschall: Flugelhorn and Trumpet 2. Unlike the majority of the Elastik–based titles from Ueberschall, these two releases don’t follow the song–based construction-kit format but, instead, are part of their Instrument Series. What you get in each library, therefore, are a series of solo instrument phrases/licks that you can piece together to form a complete performance. I could imagine busy media composers finding Flugelhorn and Trumpet 2 to be excellent resources when a little bit of atmospheric — and utterly convincing — solo brass is needed in an instant. Classy playing, classy sound; listen out for them in a movie soundtrack near you.